EXCEPTIONAL DESIGN. 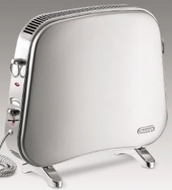 Thanks to its timeless design, the retro convector heater is the perfect complement to any home or office environment. TWO HEATING SETTINGS. Choose from HI (1500 watts) or LOW (950 watts) for just the right amount of heat. SAFETY THERMAL CUT-OFF. No need to worry about overheating. Even when the unit is accidentally covered by a curtain or blanket, the overheating protection automatically shuts the unit off. Safety for complete peace of mind. STAINLESS STEEL CARRY HANDLE for easy and convenient transportation from room to room.